This is my wife, peggy. We met online in a Christian chatroom. This,IMO, had the coolest sounding voice of all the transformers. I wish I could talk like that. Soundwave along with most of all the other decepticons ( save for Starscream ) were all voiced by the same guy. Frank Welker. Amazing darned voice actor. Consequently, Starscream was voiced by Chris Latta who also voiced Wheeljack. How do I know this? Don’t ask me. @awfulintentions: You know becuase you’re Frank Welker!!!!!!!! Apparently he turns into a truck and a satellite in Transformers 2. Good times. @Disgustipater: I heard he turns into a bottle of sunscreen at one point. and then he blows up and takes out the entire eastern seaboard. this is a Bay film after all. 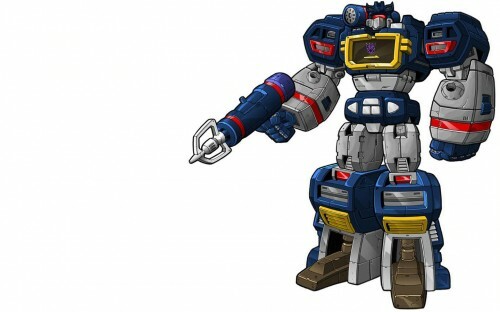 Soundwave is AWSOME! The countless hours of playing with him.. He deserves more credit then this..
What was the name of the red with grey,yellow cassette player for the Autobots? The name of the Autobots tape player was Blaster. He was cool in the comic book, kind of irritating on the cartoon.